5/31 Cup of Coffee: Salem's doubleheader with Potomac never happened, as the twin bill's first game was suspended in the third inning due to rain and both Portland and Greenville blew late leads. 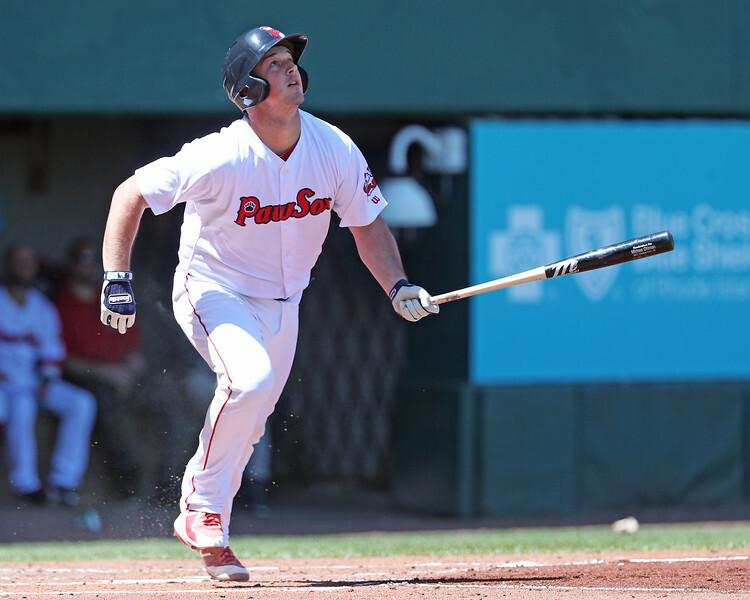 Pawtucket was the only affiliate to take home a win as Mike Ohlman (pictured) helped score an insurance run with one of his two RBI in the ninth. Pawtucket took its fourth straight game on Wednesday behind an 11-hit effort, including three from Jordan Betts and two more from Mike Ohlman and Rusney Castillo. Ohlman added a pair of RBI, including plating an insurance run in the ninth. Marcus Walden allowed an earned run on four hits in two innings of work to begin the contest, while a combination of Fernando Rodriguez, Ty Buttrey, Bobby Poyner and Ryan Brasier surrendered three hits and an unearned run in seven innings. Buttrey was the only one to allow a hit and gave up the run. Portland had a 3-2 lead headed into the seventh-inning stretch, but Austin Maddox gave up the game-tying run in the seventh and then the Fisher Cats scored a pair on the 27-year-old to take the win. He wasted Mike Shawaryn's solid start after Shawaryn allowed two runs on four hits in six innings of work. He did not walk a batter and struck out seven. Jantzen Witte drilled a pair of doubles and was one of three Dea Sogs with multiple hits. Due to rain, the contest between Salem and Potomac was suspended with a runner on first and one out in the bottom of the third inning. The second half of the scheduled doubleheader was canceled, and the game will be resumed Thursday at 5:05 p.m., with a seven-inning game, scheduled for Thursday, to follow. Augusta scored five runs in the ninth inning, all of which were on Lukas Young, to take the win. Alex Scherff only pitched two innings in a start but allowed just one run on two hits. He walked one and struck out two. Marino Campana and Jagger Rusconi each had two of the Drive's eight hits. Player of the Day: Mike Ohlman had two singles and in a light day for the system, helped Pawtucket to the only win for the affiliates. The 27-year-old came over for cash in March and started as a solid bench option but has cooled as of late, down to a .214 batting average before his 2-for-3 performance on Wednesday after being as high as .289 on May 7. It's his second multi-hit outing in his last 10 games.